Their fabulous pocket squares are a perfect addition to a gentleman’s wardrobe such as this Canaletto, which will look great for upcoming festive and new years celebrations. 100% silk and printed in the Britain they come beautifully packaged. At Rampley & Co their aim is to create pocket squares that are more interesting than the classic paisley, polka dots and flat colours you see with most squares and a lot of the inspiration behind their ranges is taken from art, history and architecture. The core focus is to produce a product that is not only beautiful and truly unique, but that also tells a story, be that of the painting itself, or the artist or designer behind the work. For example William Swainson Collection is based on the sketches of a 19th century ornithologist whose work we’d always loved and who lived a quite remarkable life as well as producing some truly beautiful images of birds. Similarly, each of Fine Art Collection has a remarkable back story and you’ll often find them discussing at length the story behind the Death Of Major Peirson or the artist John Singleton Copley. All of Rampley & Co squares are designed in London and always ensure that every item is as detailed as the last, taking time to perfect the borders and colour palettes to ensure it’s not only beautiful as a square but provides a number of fold opportunities in the pocket. 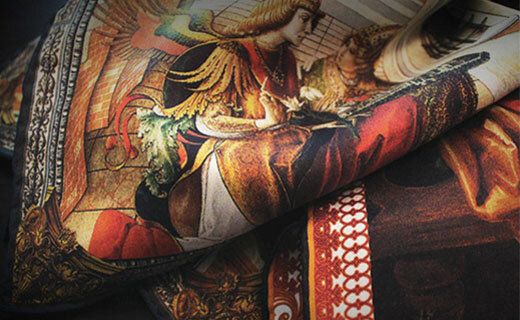 In terms of actual production, the town of Macclesfield in the UK is globally renowned for the quality of their silk printing, and they use the renowned mill of Adamley, whose history and pattern books dating back hundreds of years give you a real sense of tradition and craftsmanship. Learn how to fold a pocket square!